I made this tasty pie as per the recipe, but I can’t see why one couldn’t shortcut by putting the ingredients in a casserole dish and making only enough dough for the top crust. The dough is actually fairly simple and quick; however, there are a few steps involved for the filling as all savory pies are guilty of. This is a great weekend cold weather comfort food! Trim the lamb of fat, if necessary, and cut into 1/2″ cubes. Place the trimmed fat (or a tablespoon of oil) in a hot saucepan. Render the fat and remove the remaining pieces. Add the onion and carrot to the pan and cook for 4-5 minutes. Remove vegetables and toss the meat in the remaining fat (if there is none, add olive oil). Cook meat until browned on all sides. Heat the cumin seeds in a dry frying pan just until fragrant. Crush or grind into a rough powder. Add the flour and cumin to the browning meat stirring for 2-3 minutes. Add stock gradually and bring to the boil. Stir occasionally. Add the vegetables back to the pot and season with salt and pepper. Simmer for approximately 30 minutes or until lamb is tender. Cool. Meanwhile make the pastry: Sieve the flour and salt into a mixing bowl and make a well in the center. Dice the butter, put it into a saucepan with water and bring to the boil. Pour the liquid all at once into the flour and mix together quickly; beat until smooth. At first the pastry will be too soft to handle – place in the fridge for approximately 1/2 hour. Once the pastry is cool. roll out to 1/4 inch thick to fit an 8 inch tart tin. 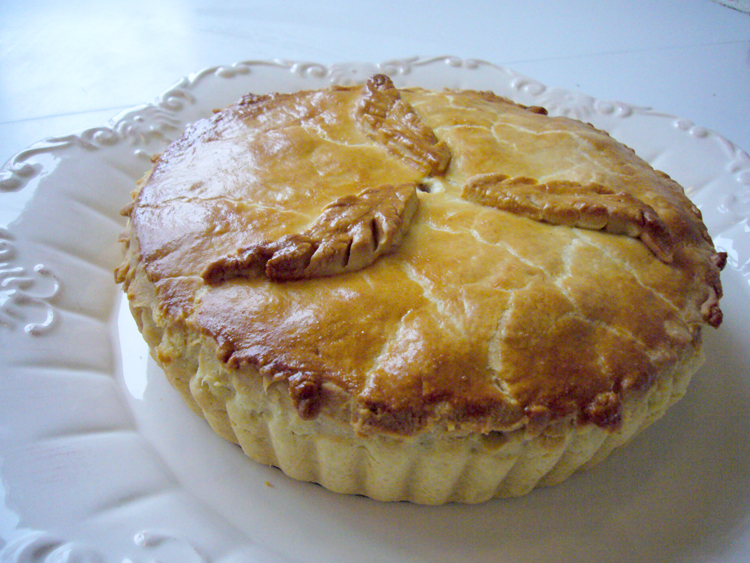 Set some pastry aside for the top and any decoration. Line the tin with the pastry while trimming the edges. Fill the pastry lined tins with the meat mixture. Brush the edges of the pastry with the water and place 1/4 inch thick pastry top on sealing the edges all the way around the tin. Decorate with any trimming and pierce a hole in the center of the pie to allow steam to escape. Brush the top with egg wash.
Cook the pie for approximately 40 minutes. This entry was posted in entree, recipes and tagged comfort, ireland by MixedSoup. Bookmark the permalink. Although your “shortcut” suggestion is excellent, I like the extra pastry in your original recipe as this negates the need for a side dish of carbs. Comfort food indeed!